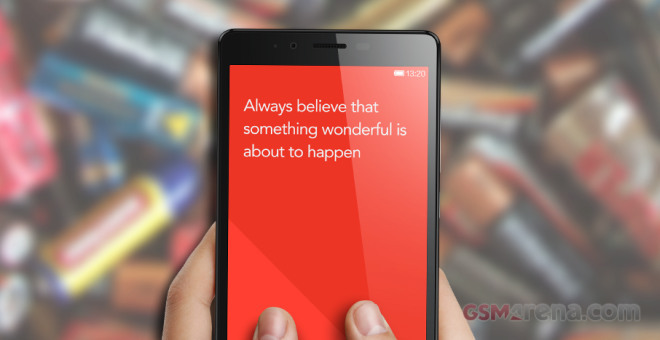 The Redmi Note is running on the MediaTek’s MT6592 chipset with octa-core Cortex-A7 processor, Mali-450MP4 GPU and 2GB of RAM. The Cortex-A7 are energy-efficient cores, but we’ve seen the same chipset performing rather poorly on the Alcatel Idol X+ and the Gionee Elife S5.5. Even though it is a dual-SIM smartphone the Xiaomi Redmi Note doesn’t support dual-call, so just one SIM card is active during our 3G talk time test. The Redmi Note scored an excellent result here, its battery provided it with enough power to last 21 hours and 41 minutes. We tested our web browsing script on both Chrome and the MIUI web browser, and they achieved similar endurance. The score its is rather unimpressive though – the battery went flat in under 6 hours in both cases. A phablet with a 5.5″ display should be able to server as a portable video player and the Redmi Note indeed packs impressive support for video and audio codes. Unfortunately it will last you only 5 hours and 18 minutes before its battery drops down to 10%. A very bad result for such a big battery. Finally, the stand-by endurance of the Xiaomi Redmi Note was impressive – with both SIM cards active the phablet had enough power to last almost 20 days. 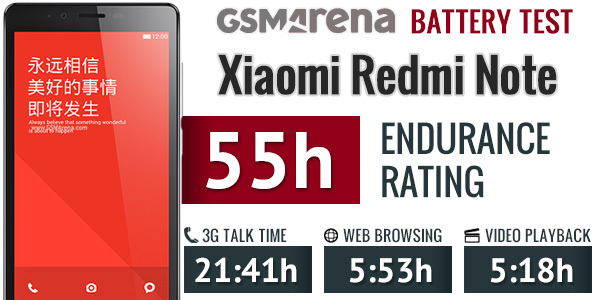 The great standby score and the amazing call test result helped the Xiaomi Redmi Note post a final endurance rating of 55 hours, which means you can count on over two full days if you do an hour each of calling, web browsing and playing video per day. Heavy users will actually be getting rather limited power autonomy, though, while those who mostly use their phones for calling will be able to get more than our rating suggests.